Crawl Space Encapsulation Products- How to choose the right one! Do it Right the First Time- Have you ever heard this used in terms of crawl space encapsulation? What about, “You get what you pay for” or “if you’re going to do right do it right the first time.” When it comes to encapsulating the crawlspace to keep moisture out of the home nothing rings more true than these expressions. The most common mistake that is made in crawlspace encapsulation projects is in selecting a vapor barrier. Most homeowners just know they need to get the humidity level down in their homes so they will not have mold problems in the future. They have heard that laying plastic down in crawlspace will help with this problem. People head out to the local hardware store or calling an in-expensive handyman who knows how to install plastic in a crawlspace to quickly solve the problem. However what most homeowners don’t know is that has not fixed the problem but instead have just set themselves up for greater expenses down the line. What??? My Newly Encapulated Crawlspace isn't Fixed? What you may not know is that plastic is not just plastic. The 4 & 6 mil visqueen we have all come to know well does have a place in the home improvement world when it comes to temporarily blocking off rooms you don’t want dust to fly into or covering up your furniture from getting messed up, but it does not have a place in crawlspace to protect you from moisture coming up from the ground. The problem with 4 & 6 mil visqueen you can buy at any local hardware store is that it is made from recycled plastic products thus making it inexpensive. The problem with this inexpensive visqueen product is that because it is made from recycled resin it degrades fast. In fact visqueen starts to degrade 6 weeks after being exposed to the elements in your crawlspace. Also because visqueen is made for recycled resin it does off-gas those giving mold spores food to grow on. Thus in 3 to 5 years homeowners will have to replace this liner in their crawlspace and once again shell out more money to fix a problem such as moisture in their home. What Plastic Sheeting Vapor Barriers Should I Use? Well like they say “if you going to do it right do it right the first time.” This means do a little homework and not rush to fix a problem with a quick fix. 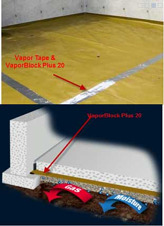 First select a good Vapor Barrier for your Crawlspace. When looking for a good Vapor Barrier for your Crawlspace you should look for a liner that is made from Virgin Resin. This is the most important thing because Virgin Resin Vapor Barriers will not break down over time and also don’t off gas making it so mold can’t grow on the barrier itself. There are many different types ranging in thickness from 8 – 20 mils in thickness depending on your crawlspace needs. Using a Virgin Resin Vapor Barrier in your crawlspace will ensure that you only have to encapsulate your crawlspace once and that your home will be safe from further moisture problems. What are some good brand names to look for? Use what the professionals use: Poly-Scrim How do you know these products will do the job? Ask for data sheets that will show you whether the vapor barrier passed the tests (ASTME) for doing the job properly. If you live in an area with radon, now your life depends upon getting the correct vapor barrier that has a tight knit cell structure to keep the radon at bay.